Our registered trademark demonstrates our desire to create exhibits that will launch the imaginations of our youth, to invent new ideas for the future. The most realistic and historically accurate spacecraft reproductions available. Engaging simulators to help museum visitors experience some of the challenge and thrill of space flight. Educational resources, including spacecraft Information Kits, handbook illustrations of US manned spacecraft, and actual spacecraft artifacts. Information About Us and Our Approach to making exhibits and simulators. The latest news, and brochures describing our exhibits. Space artifacts for sale, including space collectibles. To talk about your exhibit and educational needs, please Contact Us and we will try to help you. 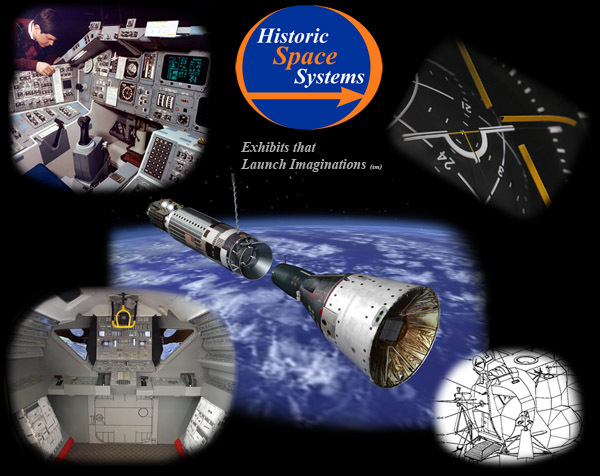 All images and text on this web site are © Historic Space Systems. Images and text may not be published in print or on the Internet without the expressed consent of Historic Space Systems. Exceptions to this are all images credited to NASA, and all Handbook Illustrations. Enable ActiveX controls to use the navigation menus. Google Analytics helps us evaluate site traffic.